Kevin Ward Jr exited his winged sprint car after making contact with Stewart and getting spun into the wall, rupturing a tire and ending his run. Ward narrowly is missed by another driver(the blue and white #45) as the caution flag has been thrown and cars are slowing down. 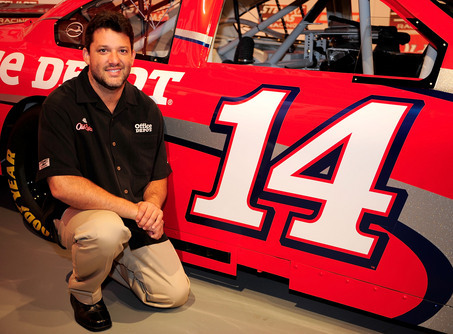 He continues down the track, in a black suit, black helmet, and black shoes, on a brown dirt track, with dim lighting, pointing a finger at Stewart’s traditional #14. This is when it all goes wrong. Sprint cars are not driven like normal cars. You don’t turn left to go left. Winged sprint cars, on dirt, are driven with throttle more so than steering. In order to go left, you turn right. This is exactly what happens when Stewart sees Ward at the last second, he hits the throttle to wiggle the car around him, but it fails and Ward is hurtled by 800 hp spinning the rear wheels. At least this is what I see. If you hate Stewart, you see him trying to intimidate a driver by gassing it a little at him, and realizing the driver was not going to lose by playing chicken. If you love Stewart, Ward Jr should never have been on the damn racing surface in the first place. No one will ever truly know what was going through Stewart or Ward Jr’s minds. It was a tragic day for racing across the country and no one should have to lose their lives before they can live to old age. Accidents happen all the time, and this one could have been avoided. Tony “Smoke” Stewart Captures 3rd Cup Championship! Smoke has been a long time fan favorite, and for good reason. He’s crass, rude, funny, witty, and an amazingly talented driver. He now has three different NASCAR Cup titles to his name, Winston, Nextel, and Sprint. This last one coming to a tie in the chase standings, but winning the tie breaker over Carl Edwards with five wins. Stewart now has a championship for Stewart-Haas Racing, something that doesn’t happen often as a part owner/driver team. He is the first to do so since Alan Kulwicki did it in 1992 by himself. Stewart has credited Gene Haas with his miraculous support for finances and Rick Hendrick for engine support throughout the season. NASCAR is a team sport in many ways; pit crew, crew chief, research and development, owner, driver etc. Everyone must work together to accomplish the ultimate goal, winning a NASCAR Sprint Cup Championship. It will be interesting to see if Smoke can string together a run of championships like Jimmy Johnson has done, and it starts with this one from 2011. We here at BLFC congratulate Tony Stewart and his tremendous accomplishment of joining the list of nine NASCAR drivers who have captured 3 or more championships including: Richard Petty(7), Dale Earnhardt(7), Jimmy Johnson(5), Jeff Gordon(4), Lee Petty(3), David Pearson(3), Cale Yarborough(3), and Darrell Waltrip(3). 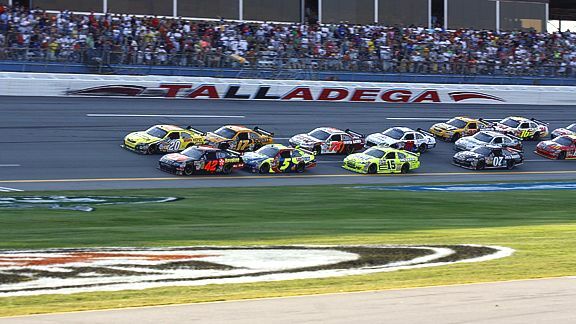 As reported by Terry Blount of ESPN, NASCAR has set up a unique stipulation for the upcoming race at Talladega on October 23rd; $100,000 will go to the driver with the most lead changes, provided the entire field eclipses the 100 lead change mark. This mark seems impossible, but it is not. This past spring NASCAR had 88 lead changes at Talladega. With a few less cautions and drivers who are hungry for extra cash to use at their disposal to help themselves or their race teams, this will be an exciting event. This is exactly was NASCAR was hoping to accomplish when it set up the stipulation coupled with a slightly larger restrictor plate(1/64 inch larger) that will give the cars anywhere from 7-10 more horsepower. If you are unaware of how a restrictor plate works, it is a plate that has a regulated set of holes drilled to allow a certain amount of air from the intake system into the engine. This drops the horsepower of the engines and thus makes racing safer as it lowers the acceleration and top speed the cars can reach. At a track like Talladega where drafting is the key to speed, NASCAR is now changing its stance slightly as the cars have become much safer in the past years with the Car Of Tomorrow and the Hans device. How will extra horsepower plus a cash bonus stipulation affect the race at Talladega on the 23rd of October in the Chase? I believe we will see less cautions. Drivers will be aware that more horsepower is at their disposal and that passing with teammates is crucial to success, and for extra cash. The race will produce higher speeds than we have seen in recent years with extra HP on tap. Less cautions will be crucial to eclipsing the 100 lead change marker that NASCAR has set up. Is this a cheap ploy to get more people to watch the sport however? I don’t think a cash bonus is enough to draw new fans into the sport, however it is enough to get the casual fan to pay more attention to the outcome, or how many cautions or lead changes have happened. All trivial things when most people just look for the top 10 finishers and that is it.